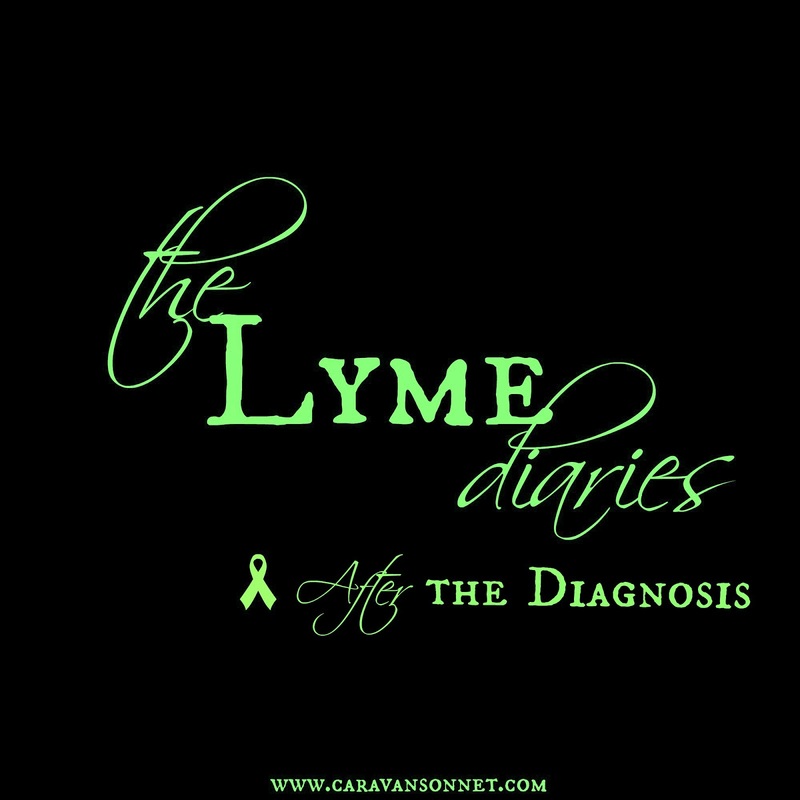 When I was first diagnosed with Lyme Disease I had a very emotional response to the news. It was not a pretty sight, and to be frank it wasn't "accepting" at all. I fit the complete profile of a lady who went through the stages of grief. For many, like myself, who are diagnosed with Lyme Disease, the process to get the "official diagnosis" is a long and winding trail that has taken years to track down. In my case I had seen (across the country) 273 different specialists and "top doctors" before I was diagnosed. I had been told by countless GI practitioners that the intense pain that I was experiencing was simply "in my head" and that the reason that I wasn't eating properly was because I was "seeking attention". I had been told by countless doctors that I should seek psychological help and that it was simply "stress" that was causing my confusing symptoms. I had been told that my diagnosis of Chronic Fatigue and Fibromyalgia were correct and that I had a very "complex" case of both of these and simply needed to "rest". It was a long tiring road to get a diagnosis and when it was suggested that I spend several hundred dollars to be tested for Lyme I at first dismissed the idea. I had had Lyme in 2007, been treated at John Hopkins Lyme Center, and there was no way that I could still be dealing with it. At the same time, in the back of my head though, I had a sinking feeling that was exactly what was going on. The strange symptoms that had persisted, morphed, and caused tremendous havoc on my body for 6 years suddenly seemed to not be so strange and seemed to have a startling pattern. I got the tests back on my 33rd birthday. I was "positive" in every test and the tests didn't looks "so pretty". I had Advanced Late Stage Lyme Disease. 3 Months later I was diagnosed with Skin Cancer. My point is in sharing this part of the background of the story that I was desperate to find answers and to get my life back. I was back in graduate school obtaining my second masters at the time and I thought, "well I know how to research, I will just research all that I can". I was veracious about research and read every single thing that I could get my hands on. A lot of it wasn't so encouraging and a lot of the stories that I read brought tears to my eyes. A lot of people that I tried connecting with were "secretive" in their knowledge and information as high insurance liability has forced many Lyme doctors to "work underground" and patients were sworn to secrecy. Within three weeks of my diagnosis I contacted 73 of the leading Lyme Specialists and learned quickly that I was looking at spending approximately $2000 to just see the physician for a check up (and this didn't include the lab work, the specialized testing, the treatment, etc.). I learned quickly that most Lyme Doctors do not take insurance and while I could submit forms to my insurance carrier on my own, most would not acknowledge the doctor and therefore I would not be reimbursed. I was told by hundreds of people that I contacted over the internet that "they didn't want to be discouraging but that my hopes of returning to my normal life were over". Those first few weeks were incredibly disheartening and to add to that trauma (the only word I can use to describe being diagnosed with a life threatening illness and being told that there is little hope) I lived most of the year in the south. The south where doctors informed me that "there is no such thing as Lyme Disease". The south where the newspaper wrote that "Lyme Disease is only in the north and ticks stop at the Mason-Dixon line" (yes, that is a quote!). The south where my pharmacist had no idea what medications should be used for Lyme Disease or why certain drugs are dangerous for Lyme patients. The south where countless specialists (that I was seeing at that point) told me that I should be "concerned" that I was given such a "inaccurate" diagnosis". It was a long long road at the beginning. There were tons of tears, tons of overwhelming moments and tons of times where my parents and I just looked at each other, our mouths saying nothing, our eyes saying everything. Even now, as I write this, I still have tears as it was an incredibly painful, scary, and lonely time. If you have ever had a family member diagnosed with a serious illness you know exactly what I am talking about. As the emotion started to settle into a state that was new to all of us, we made the decision that a "complimentary" approach would be best for my case. At that point after the research that I had done, we chose the Whitaker Wellness Institute in California. It was a difficult decision but one that we believed in and with the help of generous friends and family members who donated $2,000, I spent three weeks out in Newport Beach, California receiving treatment. While I was out there (alone as we did not have the funds for anyone to come with me) I was diagnosed with Cancer, had surgery, and continued to receive treatment for Lyme Disease, all while being thousands of miles away from my family. When I arrived in California I had difficulty walking (mostly used a wheelchair), couldn't eat any foods except for a few specific ones, my digestive system had crashed, and I was seriously (and non dramatically) near death. (In fact, one of the first things I asked the doctor was that I wanted her to be "straight with me" as I wanted to go home if I didn't have much time left.) 3 Weeks and $14,000 later I was on my way home able to walk and eat a well rounded diet after three weeks of hyperbaric oxygen and vitamin c treatments. I felt like a "new woman" and was incredibly excited for the future. My doctor even assured me that she thought that I would be returning to work full time by winter 2014. Obviously this was not the case. When I had arrived at Whitaker Wellness Institute I had chosen them because I believed that there would be a "complimentary approach". Unfortunately, I was to discover that the "complimentary approach" was for me to continue to go back to Whitaker Wellness Institute several times a year to receive these treatments and they did not believe in antibiotic treatment. With limited finances there was no way that this would be possible. As fall 2013 approached November it became obvious that the medical care that I was receiving out there would not be "transferable" to a long distance relationship. The fall 2013 was incredibly difficult not just physically (where I was going to the ER at least once a week) but also emotionally. When my doctor became difficult to work with, I had to make the difficult decision to leave that doctor. I wrote in a post here about why as a seriously ill patient this is such a difficult thing to deal with. December 2013 was probably the most difficult and terrifying month of my entire life as I had several hospital stays and lost several acquaintances and friends to various illnesses. In addition to this, I experienced the heartbreak and loneliness that often accompanies long-term or chronic illness where friends and family members that I thought would support me on this journey "disappeared". It was emotionally devastating. I was also told by several well known hospitals who were reviewing my case (including Mayo, Cleveland Clinic, and MD Anderson) that there was "nothing that they could do" as my case was to far advanced. As January 2014 came and went it was obvious that my health was rapidly declining and we had no idea where to go from there but the Lord brought a new doctor into the picture (also out in California). While February was difficult at the beginning, the cruise was a blessing and really a time of reminding me to keep fighting. And then I flew out to California for my appointment and was given an entirely new plan. This plan included results from blood work that had not been done previously, the shock of finding out that I had an environmental illness on top of Lyme and Cancer, the reality of learning that I did have the MTHFR gene mutation (which is important to understand in illness, especially with Lyme Disease), and the fact that I also had Mast Cell Disease (something that at the time I did not share and have not shared until now), plus dealing with some other co-infections and that I had a serious case of Mono was overwhelming. At the same time though I was at peace. For me, my prayers of finding the right medical team had been answered. It was a long long road to get to the right medical team but the Lord was faithful throughout the journey. As long as it took I can still look back and thank the Lord for the "detours" that led me to my team. My greatest advice to any newly diagnosed "lymie" that I talk with is to give yourself permission to cry, lean on your support team, and breathe. Don't give up when you hear all of the discouraging news that you will hear at the beginning. Don't give up if you live in an area where Lyme is not accepted or understood yet. Don't give up when medical doctors tell you that "there is nothing they can do". Don't give up when you are told "it is all in your head". Don't give up on the days that you feel like giving up. I truly don't believe that with such a complex and misunderstood disease that there is "one way of healing" for every Lyme patient. I think that you need to understand your body, understand the complex situations and ways that it has caused havoc on your body and make decisions that are right for you. Find the doctors and the medical team that is going to treat you like an individual and who are not just trying to treat symptoms but help you beat this beast. Cling to the people that walk this journey with you and make peace with the fact that there are many people (especially many that you never thought) who will walk away. For me it was heartbreaking to have one of my best friends (for over 10 years) and many others simply desert me on this journey. But sweet friends, commit that to the Lord and move on. Use your energy for healing and walk in forgiveness. The time after the diagnosis is overwhelming and incredibly scary. Many times the months and years after the diagnosis are incredibly complicated, financially draining, and emotionally taxing. It can be incredibly tiring to even try to explain what Lyme Disease is to friends and loved ones, let alone understand it yourself. Hang in there sweet friends. Take one day at a time. Don't give up. Girl! Thanks for sharing. I can't believe everything you had to go to get diagnosed! I dealt with this years ago -- I had such a rare condition that most doctors hadn't even heard of it! PS Skin cancer too? Did I know that?? Aww thank you friend. This was a post that was hard to write (remembering so much pain) and yet such a blessing to remember all that the Lord has done. I am so sorry that you had issues with the medical community too! SO discouraging sometimes!!! :( Did I know this?!? I am so sorry if I did!! I don't think we were connected in bloggy world yet when I was diagnosed with Skin Cancer. I mention it briefly sometimes but mostly I am incredibly thankful that as of September I will be two years "Cancer free" with no new spots! This has been such a huge answer to prayer!! My heart is heavy and joyful for you all at the same time! God is so good! I continue to pray for you :) I'm so glad our paths crossed in the bloggy world. God is doing and has done some amazing things on this journey! I am excited to see how He continues to work in your life. Thank you so much Kat!! I am so grateful that our paths crossed in bloggy world also and I am so thankful for all of your encouragement and prayers! Thank you so much for your kindness and your continued encouragement in this very long journey!! Thank you again! Linda, your prayers are the best gift that you could give! Every single day in this journey I see the THOUSANDS of ways that peoples prayers are answered! SO please keep praying! Thank you for taking the time to comment and all of your prayers! p.s. I would love to have emailed you back directly but unfortunately you are a "no reply blogger". I hope to connect more with you in the future! Rebecca, I hope you are on the road to wellness with the newer California doctor you have. So sorry you have to deal with this scourge. I can relate because I have had Lyme for over 20 years. I had a few years in the early 2000 in remission but I either had a relapse or was re-infected. These last 3 years have been hell. I live in the north and even though it is considered endemic here, there still is a big denial of the disease. I think people don't realize that it isn't just Lyme most of the time, there are several co-infections, parasites, funguses, gene mutations, viruses run amuck that everyone is different. A lot of people have been infected up here on the east coast and many of them are lucky to get treated early and have no complications. It makes it harder for the ones who get chronically ill to be believed that they are indeed disabled by it when their neighbor took their medicine and is fine. I have gone many routes to try and get well, now I am exploring more untraditional means. I've dealt with mainstream medicine enough to know that political constraints are ruining our health system. If anything else this disease has been a real eye opener. Good health to you in the future and keep fighting...I know I will be doing the same and praying for us all. Thank you so much for your kind comment! I am so blessed to be with the current medical doctor and team that I have! They have found so many "clues" (like the things that you mention... the co-infections, gene mutations, etc.) that were HUGE pieces of the puzzle and are helping me get better. It is a SLOW going road but as I look back on the past three years (specifically) I can honestly say for the first time that I am SLOWLY healing. I am so so so very sorry to hear of your Lyme struggles also and that the last three years have been so difficult. You are right that even in the north where it is considered an epidemic there is still LOTS of denial. It does make it so hard for those who are chronically ill to be believed - especially with how Lyme manifests itself so differently in different people. It can be quite discouraging. I am so sorry for your long journey. My prayer is that these new untraditional means that you are exploring would be of help and healing to you. May God bless you with continued strength and encouragement as you continue to fight so hard. My prayers are with you. Please keep me updated!! Nicole, I so apologize for the long delay in my response to your post comment. For some reason I didn't see it until now. Thank you so much for sharing a bit of your story and for your encouraging words. I hope and pray that in this new year of 2016 your health has returned and that you are feeling well. Thank you again for your kindness and your encouragement as I share my story. Your words were an incredible blessing!